Here I go again..: True meaning of "Khal"
Clever clever! haha and pretty darn funny to boot. I almost believed you when you started about the Latin thing. I do applaud the cleverness, I really do. 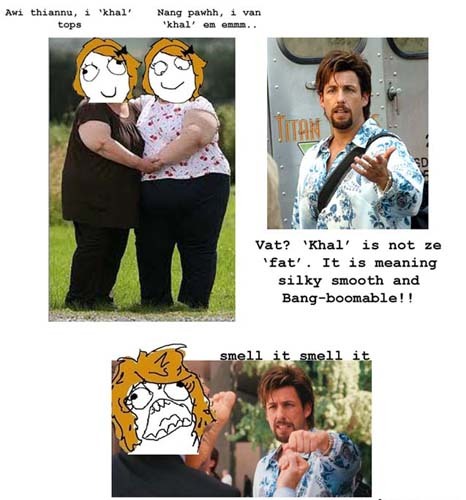 However, as a non-Khal person who strives very hard to metamorphise from 'Thau' to 'Khal,' I will admit that this post made me want to go hog on bacon and cheese sandwich (extra cheese) and top it off with non-diet coke, super large. And don't forget extra bacon. Like they say, bacon is always the answer. I've always thought Khal to be like how you explained. In a world where super models are too skinny that they are not attractive any more, and in spite of that girls still take pills to be thin, I think its the responsibility of you guys to make aware that girls are much attractive when they are khal, and not thin, but not fat. Good post. @Kima - hahaha..but not too much cushion.